The Ordovician fossil record contains a diversity of marine invertebrates, including graptolites, trilobites, brachiopods, and conodonts (early vertebrates). A typical marine community consisted of these animals, plus red and green algae, early fish, cephalopods, corals, crinoids, and gastropods. A drop in sea level may have contributed to the mass extinctions that characterized the end of the Ordovician, in which perhaps 60% of all marine invertebrate genera went extinct. During the Ordovician Period in New Jersey, shallow seas gave way to deeper oceanic conditions. The shallow water limestone's and their reef-building organisms were replaced by dark colored shale's and mud stones and organisms typical of a deep-water environment. 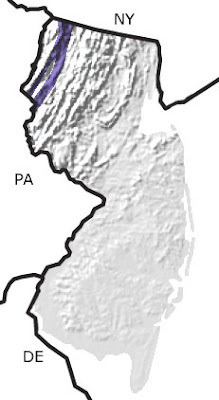 This change between environments is evident in the Valley and Ridge Province of northwestern New Jersey. North American Paleogeography: During the Ordovician, Laurentia was located near the equator while it rotated about 45° counter-clockwise, closer to its present orientation. 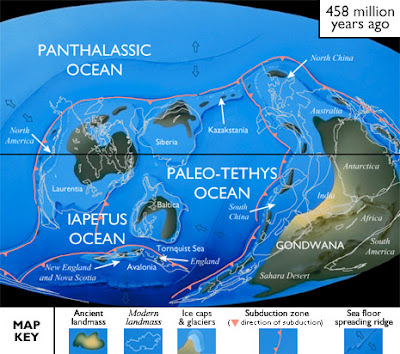 A shallow sea covered most of the continent, depositing limestone's, shale's, and sandstones. However, by the Middle Ordovician, its southern margin (now the East Coast) was uplifted due to a collision with an island arc. Glaciation at the end of the Ordovician resulted in a drop in sea level, so some rocks deposited earlier were exposed and eroded.